At an event in New Delhi, Chinese smartphone manufacturer Oppo has announced a new limited edition variant of the Oppo F1s in India. The Diwali edition of the Oppo F1s has a special packaging and also has Diwali pattern gilded at the lower back. To make it more interesting, Oppo has also added the signatures of their brand Ambassadors, Hritik Roshan and Sonam Kapoor. Oppo F1s was launched in August at Rs. 17,990 and looking at the success of the phone, company decided to bring back the phone with some visual upgrades. It boasts of a fingerprint sensor that claims to unlock the phone in just 0.22 seconds. All the specifications are similar compared to the basic version of F1s. Oppo F1s Diwali Limited Edition has a 5.5 inch IPC HD (720p) display with corning Gorilla Glass 4 protection on top. Under the hood, it has a 1.5 GHz MediaTek (MT6750) processor with 3GB of RAM and Mali T860 GPU. On the storage front, it has 32GB in built storage and a microSD slot which supports up to 128GB of microSD. It is powered by a 3075 mAh battery. On the camera front, it has a 16MP front camera with 5P lens and f/2.0 aperture for selfies, and it is the highlight of this device. On the back it has a 13MP camera with PDAF, LED Flash and f/2.2 aperture. Apart from this, the phone runs on Android 5.1 Lollipop with ColorOS 3.0 on top. Connectivity options include 4G LTE, VoLTE, Wi-Fi, GPS, Bluetooth 4.0 and a microUSB port. It measures 154.5 x 76 x 7.38 mm and weighs 160 grams. The Oppo F1s Diwali Limited Edition is priced at Rs. 17,990. Interested customers can pre-order the phone from Oct 8th to Oct 13th through Oppo concept stores. 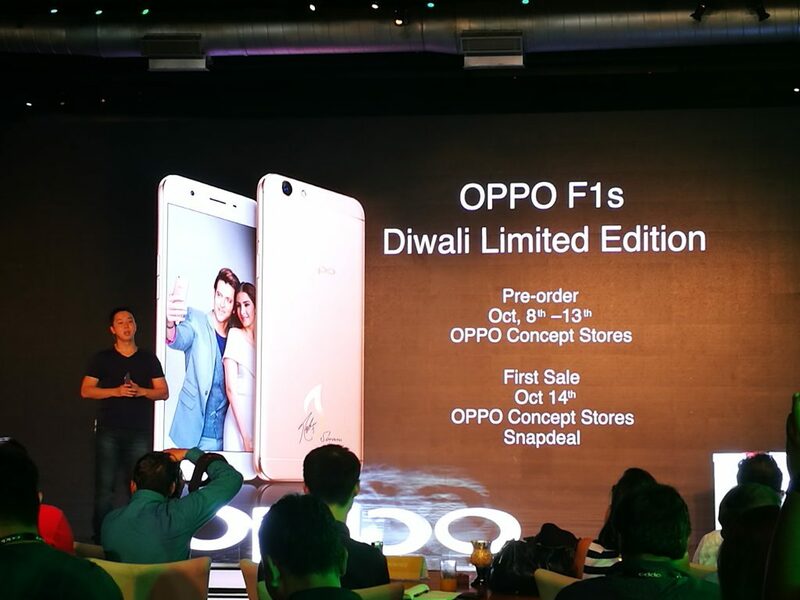 The first sale is scheduled to be held on October 14th on Snapdeal, and also at the Oppo concepts stores across the country.